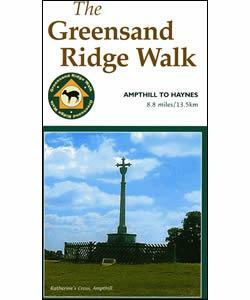 Greensand Ridge 3: Ampthill-Haynes Walk at Ampthill Walking RouteThe Greensand Ridge Walk runs 40 miles from Leighton Buzzard to Gamlingay, following a ridge of greensand which rises from the clay vales on either side. This section passes by Church Meadow, Mauldon, a Site of Special Scientific Interest with a diversity of flora and fauna, and Chicksands Wood, one of the largest ancient woodland sites in the county. How to get there by car: Ampthill is situated in mid-Bedfordshire, approximately 8 miles south of Bedford on the A507. Parking: There is a large car part in Ampthill Park. Start description Bedford Street, Ampthill. The Greensand Ridge Walk runs 40 miles from Leighton Buzzard to Gamlingay, following a ridge of greensand which rises from the clay vales on either side. This section passes by Church Meadow, Mauldon, a Site of Special Scientific Interest with a diversity of flora and fauna, and Chicksands Wood, one of the largest ancient woodland sites in the county. End description The small hamlet of Deadman's Cross on the A600.